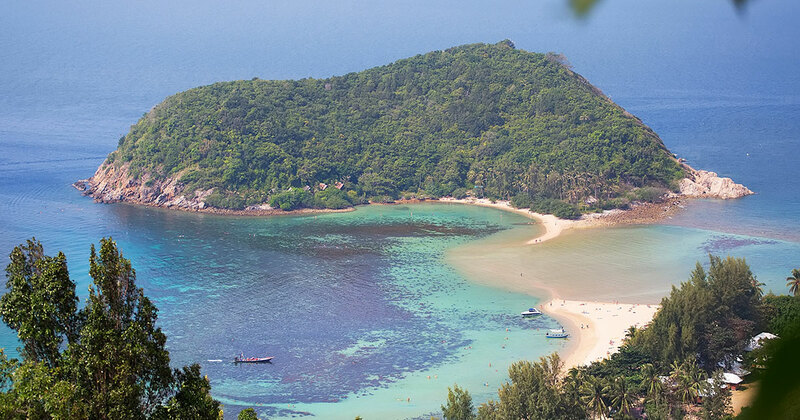 Koh Phangan is the largest of Samui’s neighbouring islands, with an area of 168 sq km. The island has numerous heavenly white sand beaches and secluded bays all along its coastline, some of them reachable only by a boat cruise. Over three quarters of the island is mountainous tropical forest. Much of the island is classified as “National Park” by Thailand’s government, allowing the island to keep its natural and untamed character. Nearby Koh Ma has the best Koh Phangan-area snorkeling. Here, you can jump into the water and enjoy the amazing soft coral and multi-coloured fish in the warm water. Our professional guide will assist first-time snorkelers and gladly point out the best places to spot marine life. The next stop is at “Tong Nai Pan,” where you’ll have plenty of time available to swim and explore the shore at this beautiful beach. After enjoying the double bays, we continue on to the south of Koh Phangan to Than Sadet bay, where you can visit the lovely waterfall. After a short climb onto some big rocks, you can jump into the fresh water pool at the base of the waterfall and then dry off lazily on the huge granite rocks. The river and waterfalls, once visited by Royal Majesties King Rama V, VII and IX, have their initials carved into the huge granite rocks that grace this river. This has become one of the most tranquil and popular places on the island to visit and relax. Our last stop is at Haad Rinn beach, long world-famous for its monthly Full Moon Party, held on each full moon.